Cute character toy included (and who wouldn't be happy to see this little critter?). This is reusable. 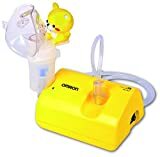 If you work in a clinical area where you regularly nebulise children, this is a great piece of kit to add to your collection. However, be aware that nebulisation rate is significantly lower than with standard devices.